A sweet little Lavender Owl filled with dried lavender from Sunny Nelson. Owls love dark places and are creatures of the night, they love nothing better than hanging out in wardrobes or accompanying you as you drift off to sleep. 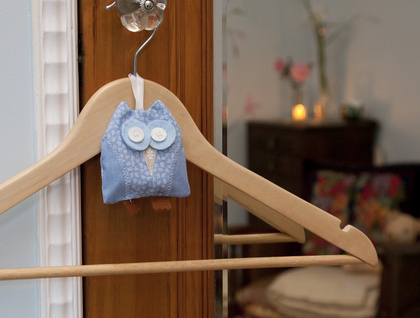 Hung on a coat hanger he will deter moths from your closet and spread lavender goodness through your favourite things. Tucked under your pillow he will fragrance the air giving you peaceful slumber and pleasant dreams. HandMade from Retro Laura Ashley fabric swatches or fabric pieces that were just too nice not to use! Filled with Lavender from Nelson and ready to be your new best friend, handy ribbon hanger so you can dangle or hang where ever you please. Repurplosed retro or vintage buttons for eyes. Available in a range of colours, please specify your favourite colour when you send through your delivery details.